This is a set that I’ve been drooling over for a while now. 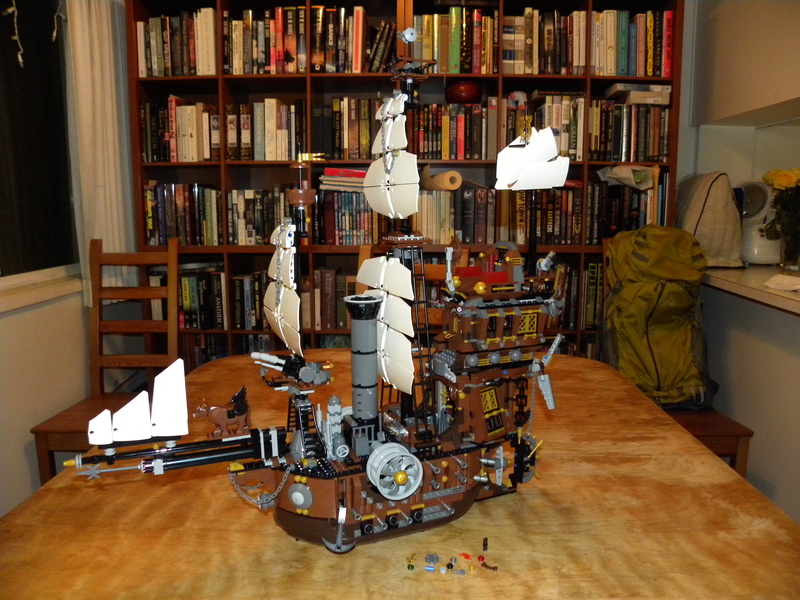 A huge, steampunk pirate ship captained by a crazy steamborg, how could that not be awesome? When my son and I finally braved the snow to see the movie, my resolve got stronger. I would have this set! The contents of the box are crazy. I’ve never put together a set this big (over 2700 pieces), but the woman at the store suggested that I have a big workspace. My dinning table is big, but seventeen bags of pieces, five pieces of boat hull and an instruction book thicker than a fashion magazine, pretty much filled it up. 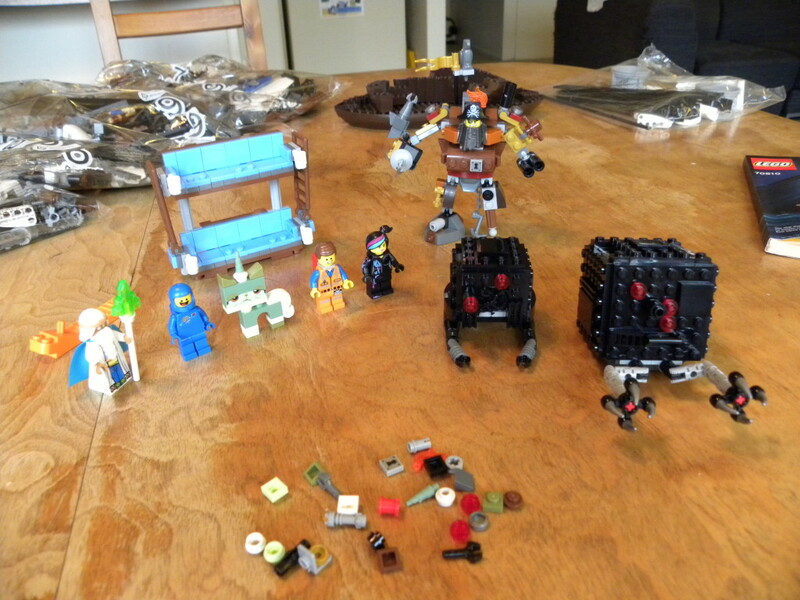 Now that everything was arrayed, I started in on the preliminary builds: minifigs and micro-managers. 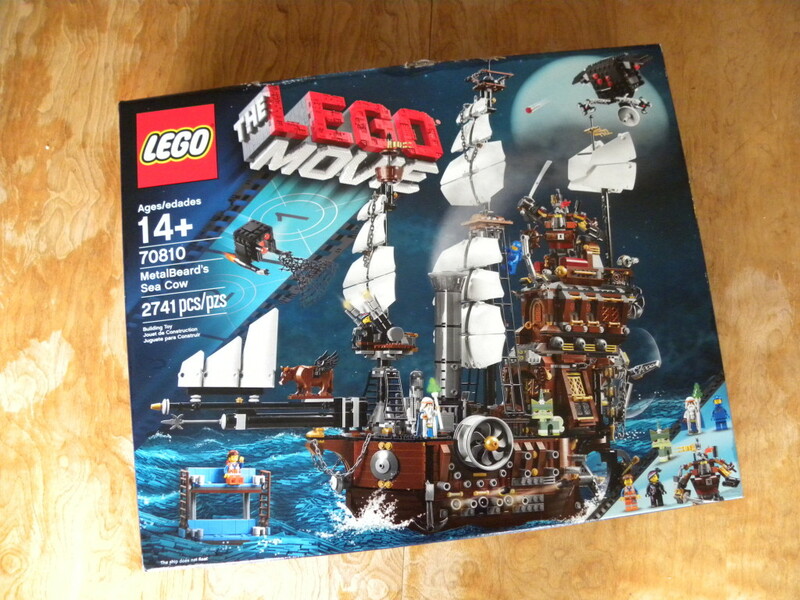 This set has most of the main characters from the movie: Emmet, Wyldstyle (hood down), Benny, Vitruvius, Queasy Kitty (a seasick Unikitty), and MetalBeard. I just got a copy of Unikitty from the Cloud Cuckoo Palace set last weekend, so it is cool to get one of her variants. 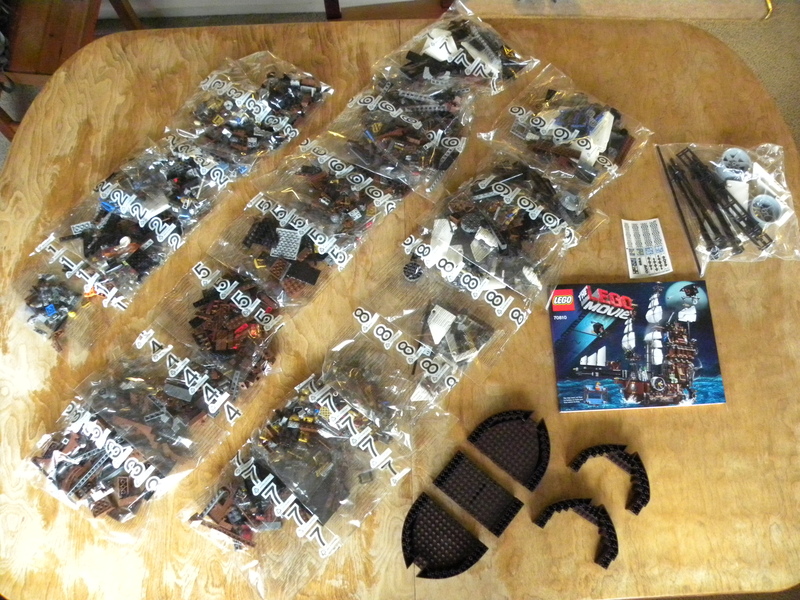 The Emmet is his more common variant (same as the one in Cloud Cuckoo Palace and the Piece of Resistance polybag). The great addition here is Emmet’s double-decker couch. I really liked the build on this model and I suspect that I’ll steal some the methods for building regular couches in the future. The blue tiles in the couch are an unusual color too, so I was happy to add them to my collection. Then came the Micro Managers. I’ve been enjoying the different builds that these models have provided. I’m still a fairly novice builder, so all of the snot building is great practice. This particular pair of the killer black cubes are larger than most of the others and have some fun features. Though I don’t get much out of the flick missiles, the net launcher is particularly cool. It took me about an hour to get these first builds out of the way while I ate lunch. They were a lot of fun, and acted as a fine appetizer for the ship itself. This was a hell of a build. I worked steadily into the night and didn’t finish until after I put my son to bed. My son helped a bit here and there, but this was a complex build with a mix of snot techniques and advanced features such as removable sections and panels that hinged open. No effort was spared on the details, with dozens of tiny details crammed into each of the cabins and the lower decks. I really enjoyed building all of the fiddly little details. The ship’s color palette is classic steampunk, with multiple shades of brown mixed with grey machinery and gold accents. I’ll be able to use these pieces for all kinds of projects in the future. There were numerous decorative pieces that I’d never seen before: a wooden door with window and keyhole, faucets, and a tiny bottle with a ship printed on it. The brown cow figure is cool too! One of the things that I like most about this ship are the sails. As a change from the more ‘realistic’ Lego ship designs, this model uses curved technic panels for the sails. This seems like an inspired way to brick-build sails. Now I want to build more ships of my own using technic panels. I’m fairly sure I have some similar panels in red and black among my unsorted parts. I have fuel for future MOCs. As darkness set and I put the finishing touches on MetalBeard’s Sea Cow, I only wanted to build more. This huge model is the kind of thing that acts as a muse for future projects. I’ll be buying a shelf soon so that I can give the big ship a place in my room that isn’t reachable by my devil kittens. From there, it will be able to urge me on to more interesting builds of my own. 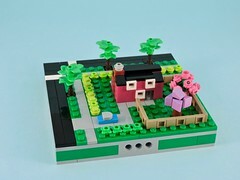 Isn’t that what Lego is for, to allow us new avenues to express our creativity? 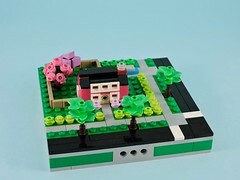 Build and enjoy! Now the question is — does it float? 🙂 What an epic build! Oh, heck no! There are technic holes in the bottom of the hull. It was an awesome build, though. I went out and bought a shelf so that I’d have somewhere to display it.